Many people, when looking to buy heat pumps, have questions about which is the best one to buy. Before you start looking at heating and cooling systems for your home you should take into account how many rooms you are wanting to heat or cool, because you get single systems for one room or area but you also get multi-systems available for homes with more rooms. Most heat pumps which include wall heat pumps will have some basic features in common, but there are also features which are unique to certain models. Everyone wants reliability, energy efficiency, quality and a reasonable warranty when they spend money on their particular heat pump. Each brand offers a different level of efficiency. Some of the makers of wall-mounted units include Mitsubishi, Toshiba, Daikin, Fujitsu, ACSON, Gree, LG Electronics and Unico amongst others. Bear in mind heat pumps which have the Energy Star logo .Energy Star is the U.S. government’s international program encouraging the use of energy-saving consumer products. Formed in 1992, as part of energy-saving and greenhouse gas reduction efforts, buy buying one of these products, you are showing your responsibility towards caring about the welfare of the environment. It is important to check which brands have the Energy Star logo. When looking for technology in heat pumps, you want to invest in heat pumps which work quietly and which also offer things like remote control and dehumidifying features. Some of the different types of heat pumps you can look at are split systems, hi-wall splits, wall heat pumps, ceiling wall, floor standing, and duct systems. Installing a new furnace is the job of a fully qualified and licensed HVAC contractor, because you want to be sure that your wall heat pumps conform to quality and safety standards. Wall mounted heat pumps can provide you with all your cooling and heating needs, making use of environmentally friendly R-410a refrigerant and DC Inverter technology. Heat pumps are designed to quietly work in your home without being obtrusive, and for this reason there is the right style and size for every room and home. With all the different types of heat pumps you get, they can be fitted in many different places. Some can be recessed into walls, some on roofs, others can be mounted on walls close to the ceiling while ducted split systems can be hidden in the ceiling. One of the most popular residential heat pump systems is wall heat pumps. These units sit high up on your wall, around 100mm below the ceiling and are able to quickly distribute heat throughout the space. SANYO offers wall mounted heat pumps which can solve all your cooling and heating needs and their heat pumps are able to adjust their performance to meet the changing needs of the room and then maintain the desired temperature which means increased efficiencies. The Fujitsu 12,000 BTU Ductless Mini Split Heating unit is pre-charged with the environment friendly R-410a refrigerant and no additional refrigerant is needed if the line set is 49 feet in length or shorter. These are highly sought after wall heat pumps because they are of the most efficient heat pumps you can get. Not only does it have a 25 SEER efficiency rating, the 12RLS is only 31in long and this makes it one of the smallest, quietest and most efficient mini-split system that there is on the market today. The Mitsubishi wall mounted heat pump is also very easy to install and offers no disruptions during installation. They offer different units styles to meet every kind of need. One of the great features of the Mitsubishi ductless air conditioning system is the fact that it can be installed within a day because there is little or no ductwork required. 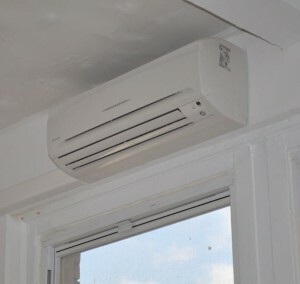 These sleek and quiet ductless air indoor unit mounts simply require a pair of refrigerant lines plus power and control wiring which is connected to the outdoor unit through a small opening in the wall. Their wall mount style is unobtrusive to the visual area within a room. Anti-allergy enzyme filter uses artificial blue enzyme catalyst on the filter filaments to capture harmful microbes. Inverter technology allows for exact temperature control. Hybrid catching pre-filter – offers antiviral and antioxidant properties. Low-ambient cooling – efficient cooling operation with outdoor temperatures as low as 14 degrees F.
A-Control for unit wiring – communication between outdoor and indoor units. Ductless air powerful mode – 15 minutes of extra high power cooling or heating. There is no doubt that The Mr. Slim split ductless air conditioner system is your answer to spot cooling or heating. It is designed to be one of the most reliable heat pumps you can get. The beauty of air source heat pumps on the other hand is that they are suitable for most homes as they are simply fitted to the external wall at the back of your property, operating quietly. While they can be attached to the wall at the back of your home they can also be left free standing on the ground. If an air source heat pump isn’t for you, you can consider any of the other heat pumps. The wall heat pumps are installed through an exterior wall so that they are flush with a building’s exterior. Through-the-wall heat pumps are designed for convenience. Most heat pumps have a duct system or an air distribution system; while the the ductless heat pump does not. It is a unit that will hang on the wall and deliver the air from the indoor part of the heat pump to the space that has been cooled without the means of a duct system. By piping refrigerant to individual coils within air handlers mounted throughout a home, mini-split heat pumps do not require ductwork for central air conditioning. Ductless mini-split systems combine the flexibility of room air conditioners with the whole house cooling of central systems. With ductless systems, there is an outdoor unit serving multiple indoor units with refrigerant being piped from the outdoor unit through small-diameter insulated refrigerant lines directly to individual rooms or zones. The name mini is used to describe the small indoor wall heat pump units which are located in each room. They are installed in the usual way and care must be taken to prevent refrigeration leaks. Indoor units are mounted flush on a wall. Ductless equipment can produce heat in a number of ways, and most people are not sure how a heat pump air conditioner functions. Heat pumps are a very efficient means to create heat in the mini split air conditioning industry.ces to keep their compressor warm in the colder months allowing them to use their heat pump system. Mini splits offer flexibility because they can be suspended from a ceiling or hung on a wall or floor-standing. These mini splits have very little- or no ducting. These mini split wall heat pumps can be used in homes, apartments, computer rooms or hotels. The amount of heating you need for your home or office will depend on the heat loss through windows and roofs and to minimize heat loss you want to make sure your home is property insulated for your wall heat pumps to operate the best they can. By insulating first, the size of heat pump selected will certainly be smaller and cheaper to install, and this is what makes heat wall pumps so popular. They are designed to be unobtrusive in size and there are many different types in attractive neutral colors and with low noise levels that are stylish. Every home is unique and the one you install as well as the cost will be determined by the uniqueness of your home. People are changing to heat pumps to save money while also helping the environment, and wall heat pumps are sought after because they don’t take up any valuable floor space in your house and they are also not a focal point in a room. What Exactly Are Ground Source Heat Pumps?